This episode of “School for Gifters” features one of the most intricate and intense designs AbbyShot has ever taken on: None other than the straps-and-snaps goodness of the Stampede Duster! 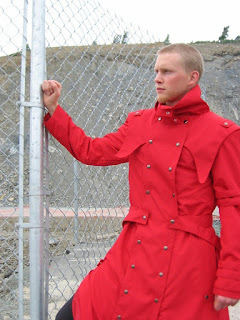 This design comes complete with a fully-removable front panel attached with snaps, straps on the arm, straps crossing the back of the coat, AND straps connecting the front panel to the back. Plus it’s available in fabric or leather versions in your choice of red or black. Oh, and did we mention it’s awesome? This coat would be a mind-blowingly cool gift for an anime fan – you’d just have to be careful to get those custom measurements right! The ideal wearer would be good-hearted but unfortunately a little accident-prone. They tend to leave a path of destruction in their wake (and are quite possibly followed around by insurance agents). The nickname “Humanoid Typhoon” may be an appropriate one. But they’re so darn charming you really don’t mind. Once again, LOTS of curiosity will ensue here (and is the key to awesome gift-giving!). The Stampede Duster is a coat that works well with a myriad of accessories. 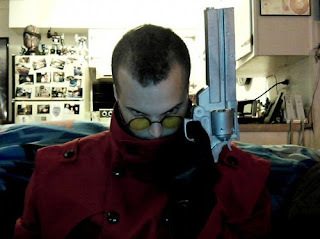 Of course some yellow-tinted “Vash the Stampede” style sunglasses would be cool (and big replica guns wouldn’t go astray!). To top it all off though, any of AbbyShot’s leather gloves would work perfectly! The post School for Gifters 15: The Stampede Duster appeared first on .